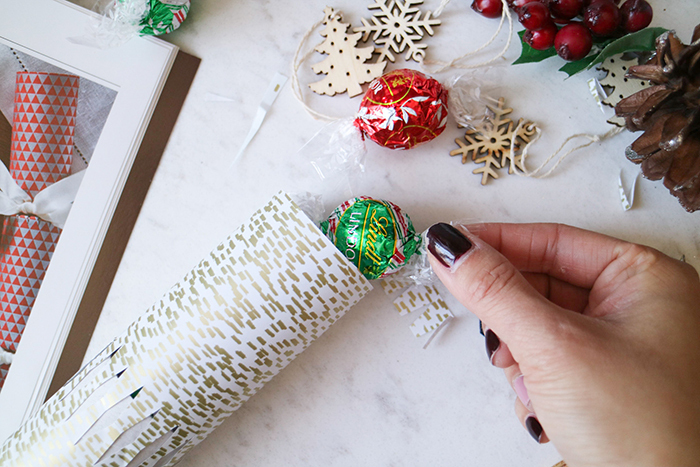 Making them on your own allows you to customize each person’s cracker and to use the wrapping paper of your liking. It’s such a simple way to add life to your dinner party, and plus, they’re just super fun to crack open! 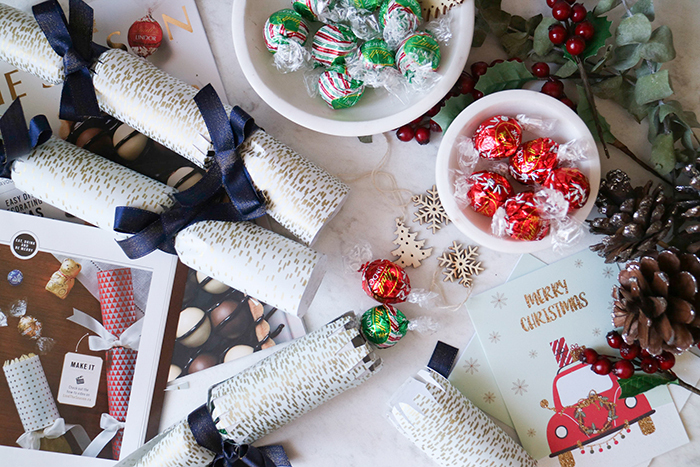 Lindt Christmas Crackers filled with tasty holiday treats! Don’t worry, they only take a few minutes! 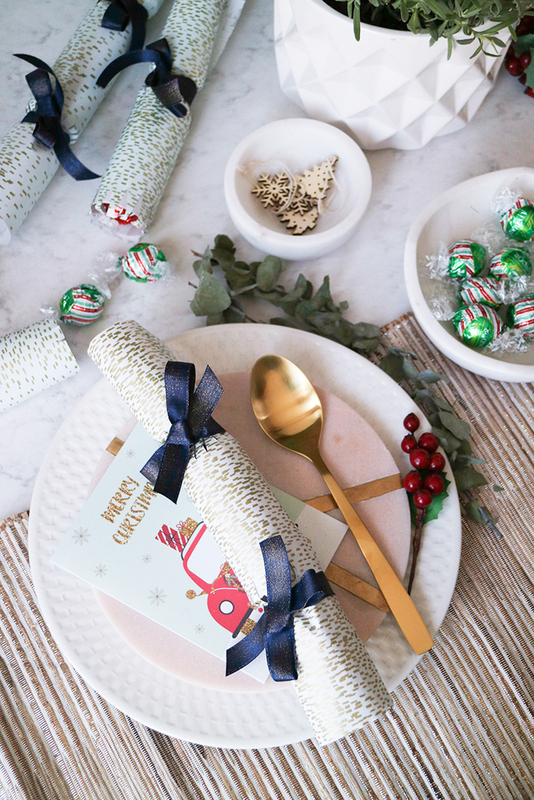 To make these DIY Christmas Crackers, all you need is a roll of wrapping paper, a handful of your favourite Lindt Chocolate ( I love the limited edition Lindor Peppermint Cookie and Gingerbread Truffles), glue gun, scissors, ribbon, card stock, cracker snaps, toilet paper rolls and a template that can be found here. Simply trace and cut the wrapping paper as the sleeve of the cracker and wrap around the toilet paper roll. Once the empty cracker has been created, fill it with chocolates and off you go! 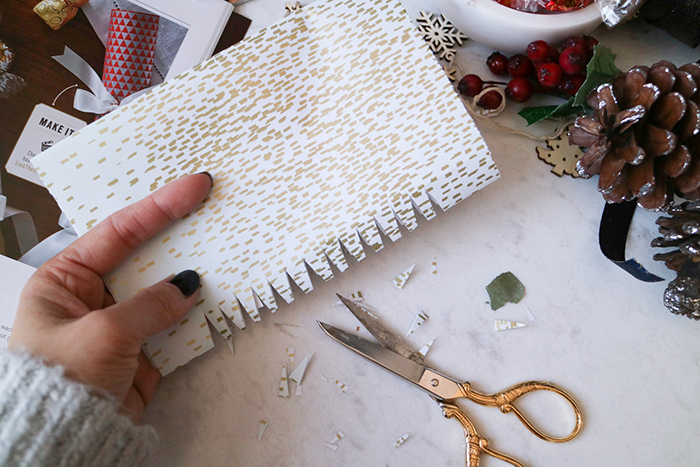 To see full instructions for this DIY, be sure to visit the LindtTheSeason.ca website. I’m so pleased with how these turned out and they look absolutely beautiful paired with my holiday place settings. 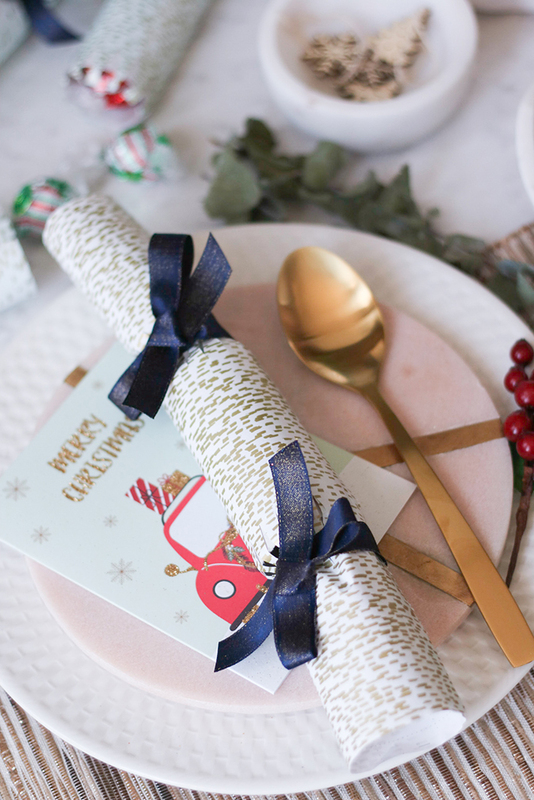 Spreading holiday cheer doesn’t require a lot of time nor effort, these DIY Christmas Crackers will certainly light a smile on your friends’ and family’s face! If you’re a chocolate lover, I urge you to either pick up the Lindt The Season Magazine or visit the Lindt The Season Website for loads of DIY and recipe ideas. All of them are super approachable and will certainly impress. 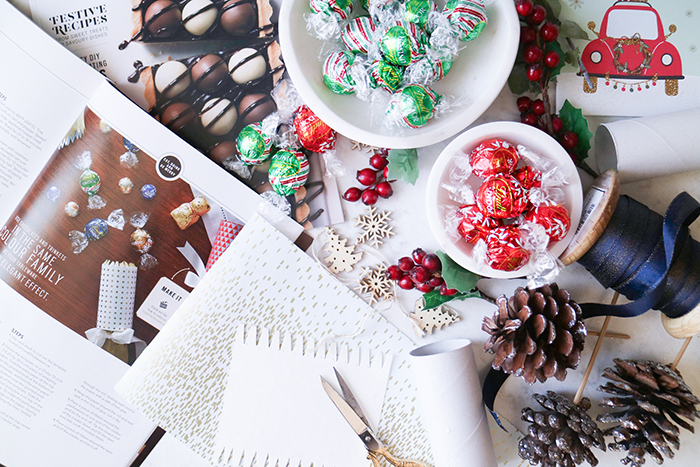 To celebrate this holiday season, I’ve partnered with Lindt to giveaway one $100 Lindt Gift Card. All you have to do is follow the instructions and enter the contest by using the widget below. One lucky reader will win a $100 Gift Card to Lindt . Enter the draw by using the WIDGET below. Contest is open from Friday, December 15, 2017 12:00 a.m. EST to December 19, 2017 12:00 a.m. EST. This contest is opened to Canadian Residents only. +5 entries by visiting LindtTheSeason.ca and commenting below which craft or recipe you’d like to try!! Disclaimer: This post was produced in partnership with Lindt, but all opinions are my own. I’d love to try Ricardo’s Chocolate Maple Crunch! Oh, I’m not a coffee drinker, but I do love tea! I’d like to make the Lindt Rudolph Peppermint Patties. How cute are they??? Salty pretzels and chocolate are such a tasty combination too. My favorite coffee festive beverage is a mix of coffee,hot chocolate and rum. I love hot chocolate the best!! One of my favourite things about winter!! My is homemade cafe mochas with LOTS cool whip & chocolate sprinkles!!! I would love to try this .. looks fabulous right ?! Cafe latte is my favourite coffee beverage. Our house hold favorite chocolate and coffee is bold double double. My favourite hot coffee beverage is coffee & at the moment egg nog coffee. I like white hot chocolate! My favourite hot coffee beverage is a latte. Dirty chai latte is my fave. I love white hot chocolate. I would love to make the Lindt Chocolate Crepe Cake. i love a peppermint mocha latte ! I just drink regular coffee with a creamer in it. The Christmas Cracker craft is so awesome! Ooh I would love to make the Orange Chocolate Cookie Gift Tag!! The beef tenderloin with dark chocolate sauce sounds so interesting! The Ricardo’s Chocolate Maple Crunch sounds incredible. I want to make that! I’d love to try the Lindor Candy Cane Cookies! They look amazing and so festive. we are lucky to live in an area with a Lindt store. I would love to try making the maple crackle crunch. I would love to try making the Lindt Chocolate Crepe Cake. Yum! That beef tenderloin with the dark chocolate recipe sounds amazing. I love to make energy balls on the regular so I’d love to try the Lindt Energy Snowballs! I’d love to make the Candied Cranberries. So simple and looks pretty yummy! I would love to use the Lindt chocolate for a savory dish such as the Beef Tenderloin with Dark Chocolate Blackcurrant Pan Sauce! The color is so rich & looks like it melts in your mouth! The Ricardo’s Chocolate Maple Crunch sounds so good and easy to prepare!